The ever-so-popular Uvita Top pattern now has new add-ons! The original Uvita Top is a relaxed knit top with a boat neck and two sleeve options (long and 3/4 length). Now with the additional pieces and instructions, you can make even more styles with the Uvita Top. Use the hood, kangaroo pocket and cuff with thumbhole to create a sporty look. Or use the floppy stand-up collar, patch pockets and flare sleeves to create a retro look. Of course you can mix and match the pieces to create a look of your very own! Don’t want to print and tape paper together? The Uvita Top Add-on pattern now includes an additional large format file (size A0 paper) that you can send to your print shop to print! 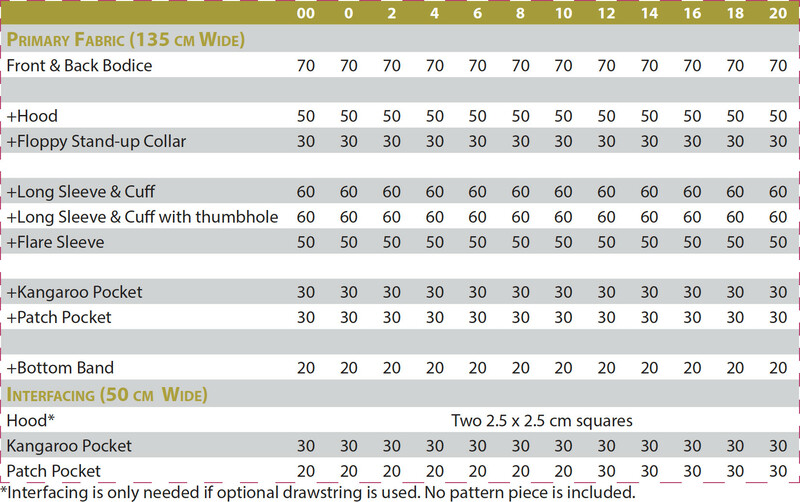 Interfacing Use light-weight knit or tricot fusible interfacing. Love ITS patterns! Classic with a touch of trend; easy to work with, but most importantly, easy access to pattern designer for quick questions. Absolutely love Kennis! It would be nice to be able to print the pattern from ‘preview’ on my computer, since that’s where my computer(an i-Mac) prints from. I have to ask my husband print the pattern on his computer( a pc). Great pattern and instructions. Love the thumb hole cuff! I thought this was a great idea. I have already made the basic shirt and found it an excellent fit. Looking forward to trying lots of variations. I really enjoy the way this add-on allows to create different views when combined with the Uvita Top. We can make it sporty, casual or even dress it up! 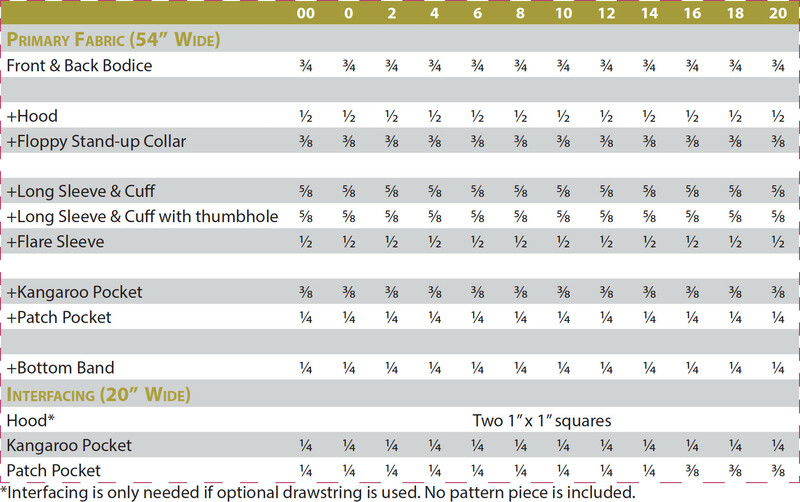 It has notches to guide you, shorten/lengthen lines and it explains how to grade between sizes to give a perfect fit. The cuff with the thumb opening is functional and professional looking. This pattern has amazing value! I made one with the thumb hole cuffs and hood and it is now my winter staple. Love the hood and front pocket. Easy instructions. I love my make. I thought this was a nice addition to the original piece. I don’t have a lot of sewing experience, so patterns like this–those that build on another pattern that I already have–help me to see that I can do more with my patterns. Directions were clear, add-ons were cute, final product turned out well. Thanks! Greet ADD-ON pakket, unfortunately I think the thumb holes thickness is to much. Also the with off the cuffs are to wide. The hoody and kangaroo poket are great. love this pattern. You can create so many outfits – very versatile. Great variations on a free pattern. Clear and precise instructions. Eine sehr schöne Ergänzung für das freebook Uvita. Wie immer alles perfekt beschrieben. Very excited to have these add one! The add-ons were good. Having a variety of options to go with a basic t-shirt is really practical. So many different tops for one pattern!! I made a tencel/cotton version with the standup collar. Very cozy. I’ve got my eyes on the hood and kangaroo pocket for a nice casual top. The instructions and drafting were excellent as always. The neckline of the Uvita top without the add-ons (the original) sits a little funny on me at the neckline and I can’t quite tell if it is a fit issue and, if so, what the issue is. I have broad and fairly muscular shoulders. I just want to say that I love your patterns. I learn a new technique each time, have a great fit without much alteration, and the styles suit me (feminine, stylish and modest with a hint of flirty). About the fit….I only have to shorten and, sometimes, put in a sway back adjustment. I can’t tell you how much I appreciate that. To get a Big 4 pattern to fit almost requires re-drafting there are so many fit issues. Thank you!!! So far every Itch to Stitch pattern has been exceptional. The instructions are easy to follow and even a novice sewer can make an item easily. I am always waiting in anticipation for the email to say the next Itch to Stitch pattern is available! This add on package is amazing! So many wonderful options to change up an already great pattern, the Uvita top! I love all of the Itch to Stitch patterns that I have tried! The add-ons just increase the uses i have for this patterrn, and easily. This pattern was lateday great, but now i can make more versions super-quick! Love how many options I have with the Uvita Add-on pack. Great value?? The instructions are perfectly detailed. I love the thumbhole cuffs for this pattern. Très bons compléments pour un haut que j’aime faire ! Love the add-on pattern. Made the bell-sleeve version with the mock neck and my 16 year old immediately took it and I haven’t seen it since. Maybe I’ll get it back when she asks me to do her laundry…..
It’s wonderful, as usual! I reccomend your patterns to everyone!